After weathering more than two decades worth of tropical storms and hurricanes, BIOS’s Tudor Hill Marine Atmospheric Observatory was dealt a serious blow by Hurricane Gonzalo in October. 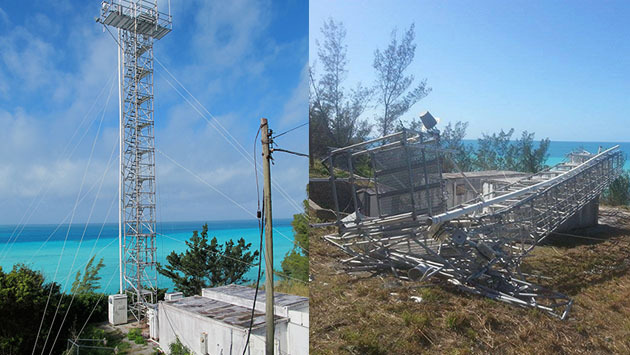 The Category 2 hurricane’s direct path over Bermuda led to the collapse of the 23 meter tall aluminum walk-up tower. Luckily, standard storm protocols successfully protected the instruments that sample aerosols and meteorological data for the observatory’s long-term datasets. The Tudor Hill facility, run by Dr. Andrew Peters of BIOS and supported by the U.S. National Science Foundation, is one of only a few marine atmospheric observatories that exist worldwide. It enables scientists to make year-round, complex measurements of particles and gases in the atmosphere over the ocean without the use of a research ship or buoy mooring. Since the walk-up tower at Tudor Hill was built in 1988, it has hosted many international and collaborative efforts to study how particles and gasses journey over and interact with the ocean. Bermuda’s remote location in the western North Atlantic makes the Tudor Hill facility an ideal location for studying aerosols and how they are transformed over time. The abundance and composition of aerosols can contribute to the heat-trapping ability of the atmosphere. As such, atmospheric particles are an important but poorly understood variable influencing climate, and likewise our ability to predict future climate change. Besides their direct impact on climate, atmospheric particles that are deposited into the ocean can profoundly impact ocean life in ways that are tied to the carbon cycle and climate. For example, Bermuda is uniquely positioned to track how much iron-laden dust is swept off the Saharan desert and carried to the Atlantic Ocean. Iron is a scarce but necessary nutrient for phytoplankton, the tiny cells at the bottom of the marine food web, and the Saharan dust can fuel their growth. The furious growth of these tiny ocean plants in turn takes up carbon dioxide, relieving a bit of our man-made carbon dioxide burden and in turn affecting climate. As winds shift back and forth over time, Bermuda is also the ideal location to contrast clean marine air from the east with more polluted North American air from the west. Most recently, two years of rainwater samples collected at the Tudor Hill Marine Atmospheric Observatory enabled a team of researchers from BIOS, Brown University and Princeton University to track sources of nitrogen to the open ocean. The new study, co-authored by Dr. Peters, surprisingly shows that the ammonium in rainwater came predominantly from natural marine sources rather than from human activities in the United States. Ammonium is a form of nitrogen and a common culprit in nutrient pollution due to agricultural practices. The study’s ammonium source-tracking results are in contrast to the way other pollutants disperse from land to sea, and challenge past assumptions about nitrogen in the marine environment. In the wake of Hurricane Gonzalo, the scientific community immediately rallied around the Tudor Hill facility and the unique long-term marine atmospheric record it has provided. Offers of support to help rebuild were quickly forthcoming. Happily, plans are being made to have the tower repaired and back to work within the next six months.